I research and teach Mediterranean art and archaeology and I am listed in the Register of Professional Archaeologists. 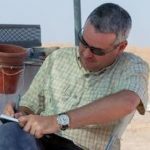 I have worked on excavations in the United States, Spain, Jordan, and Italy (particularly at the site of Morgantina, in east-central Sicily), since 1998. In 2014, I began a new collaborative project on the Iberian indigenous settlement of Cástulo, in Andalusia, with archaeologists from the University of Jaén and the Andalusian regional government. This work has been supported by grants from the Loeb Classical Library Foundation and the National Geographic Society. I have also worked to develop the emerging field of space archaeology. Together with my co-PI, Dr. Alice Gorman (Flinders University), I am leading the first large-scale archaeological investigation of a human habitation site in space: the International Space Station. This project received a 2019 Discovery Grant from the Australian Research Council (two years at AUD$244,400). Follow @ISSarchaeology on Twitter and our website, ISS Archaeology, for regular updates on this project. My publications have concerned imported pottery found at Morgantina, and the implications of that material for a new consumer-oriented perspective on the ancient economy. The final results of this research will be published in a volume of Morgantina Studies, to be co-authored with Carla Antonaccio (Duke University) and Jenifer Neils (Case Western Reserve University). A general monograph on the relationship between economic consumption and identity in the western Mediterranean and trans-Alpine Europe, titled Consumerism in the Ancient World: Imports and Identity Construction, was published by Routledge Press in late 2013. You can read reviews here, here, here, and here. My other work includes problems related to cultural heritage management and the use of digital technology in art history and archaeology. I have received several awards, including a Fulbright Grant to Greece in 2002-2003, a Rome Prize in 2003-2004, the inaugural Arthur Ross Advanced Research Fellowship from the Institute for Classical Architecture and Classical America in 2008, and a Tytus Summer Residency Fellowship from the Burnam Classics Library at the University of Cincinnati in 2010. In 2016, I was Benjamin Meaker Visiting Professor at the Institute for Advanced Studies of the University of Bristol. USERS INTERESTED IN MY DATA SETS SHOULD VISIT THE CHAPMAN UNIVERSITY DIGITAL COMMONS. Archaeological Institute of America, Register of Professional Archaeologists, Society for American Archaeology.